Color(s): Blue merle, red, tan and white, black. The Aussiedoodle possess a somewhat rectangular build, is versatile, and displays a proud stance. They are muscular, lithe, and agile. Due to their mixed lineage their appearance can vary. 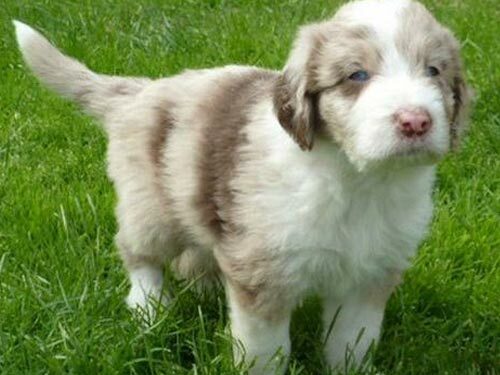 Even-tempered, loveable, and sweet, the Aussiedoodle has a pleasing personality. They typically do well with dogs and other household pets. They generally exhibit patience with children. Aussiedoodle's are friendly to everyone and do not make good guard or watch dogs. The coat of the Aussiedoodle may be curly, wavy, or straight and varies in length. There may or may not be an under coat. The Aussiedoodle is intelligent and eager to learn. They succeed in obedience and require early socialization. The Aussiedoodle will not respond to harsh or heavy-handed methods. Training must be done with reward, firmness, fairness, patience, and consistency. The Aussiedoodle is very athletic and requires a high degree of physical exercise and mental stimulation to prevent boredom. They will do well in an apartment provided that their needs are sufficiently met. Aussiedoodle's do best with a securely fenced yard where they have ample room to run.